This article is about a multinational conglomerate. For the sets of letters used in written languages, see Alphabet. For other uses of the name "Alphabet", see Alphabet (disambiguation). Alphabet's portfolio encompasses several industries, including technology, life sciences, investment capital, and research. Some of its subsidiaries include Google, Calico, GV, CapitalG, Verily, X, and Google Fiber. Some of the subsidiaries of Alphabet have altered their names since leaving Google—Google Ventures becoming GV, Google Life Sciences becoming Verily and Google X becoming just X. Following the restructuring Page became CEO of Alphabet while Sundar Pichai took his position as CEO of Google. Shares of Google's stock have been converted into Alphabet stock, which trade under Google's former ticker symbols of "GOOG" and "GOOGL". Alphabet has chosen the domain abc.xyz with the .xyz top-level domain (TLD), which was introduced in 2014. It does not own the domain alphabet.com, which is owned by a fleet management division of BMW. BMW has said that it is "necessary to examine the legal trademark implications" of the proposals. It also does not own abc.com, which is the promoted domain of the Disney-owned American Broadcasting Company (though abc.com redirects to a subdomain of go.com, through which most of Disney's sites are hosted). 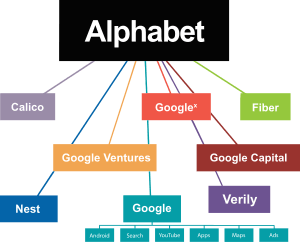 Alphabet's largest subsidiary is Google, but Alphabet is also the parent company to Calico, GV, CapitalG, X, Google Fiber, Nest Labs, Jigsaw, Sidewalk Labs, and Verily. While many companies or divisions formerly a part of Google became subsidiaries of Alphabet, Google remains the umbrella company for Alphabet's Internet-related businesses. These include many of the most iconic products and services long associated with Google, such as the Android mobile operating system, YouTube, and Google Search, which remain direct components of Google Inc. and were not made subsidiaries of Alphabet. Eric Schmidt said at an Internet Association event that there may eventually be more than 26 Alphabet subsidiaries. He also said that he was currently meeting with the CEOs of the current and proposed Alphabet subsidiaries. He said, "You'll see a lot coming." Alphabet was created as a subsidiary directly owned by Google Inc. The roles of these two companies – one as the owner and the other as the subsidiary – was then reversed in a two-step switch. First, a dummy subsidiary of Alphabet was created. Then Google merged with that dummy subsidiary while converting Google stock to Alphabet stock. The post-merger subsidiary, no longer a dummy, changed its name to "Alphabet Inc." Under Delaware law, a holding company reorganization such as this can be done without a vote of shareholders, as this reorganization was. The restructuring process was completed on October 2, 2015. Alphabet retains Google Inc.'s stock price history and continues to trade under Google Inc.'s former ticker symbols "GOOG" and "GOOGL"; both classes of stock are components of major stock market indices such as the S&P 500 and NASDAQ-100. 1 2 3 4 5 "Alphabet Inc. 2015 Annual Report Form (10-K)". EDGAR. United States Securities and Exchange Commission. February 27, 2016. Retrieved December 21, 2015. ↑ "ALPHABET INC. - DEF 14A". EDGAR. April 29, 2016. ↑ "Alphabet Announces Third Quarter 2016 Results". Alphabet. 1 2 3 Womack, Brian (August 10, 2015). "Google Creates New Company Called Alphabet, Restructures Stock". Bloomberg. Retrieved August 10, 2015. 1 2 "Google to be part of new holding company, 'Alphabet'". Retrieved August 11, 2015. 1 2 3 4 5 6 Page, Larry. "G is for Google". Google Official Blog. Retrieved August 11, 2015. 1 2 "SEC Filing (Form 8-K) by Alphabet Inc.". October 2, 2015. 1 2 Metz, Cade. "A New Company Called Alphabet Now Owns Google". Wired. Condé Nast. Retrieved August 13, 2015. ↑ Greenberg, Julia (August 10, 2015). "What Google, I Mean Alphabet, Looks Like Now". Wired. Condé Nast. Retrieved August 10, 2015. ↑ "What is Alphabet, Google's new company?". Business Insider. Retrieved August 10, 2015. ↑ Chen, Angela (August 10, 2015). "Google Creates Parent Company Called Alphabet in Restructuring". Wall Street Journal. Retrieved August 10, 2015. ↑ "Google's Larry Page explains the new Alphabet – CNET". CNET. Retrieved September 19, 2015. ↑ Levy, Ari. "Google passes Apple as most valuable company". CNBC. NBCUniversal. Retrieved February 1, 2016. ↑ Krantz, Matt. "Apple not going down easy as it overtakes Google parent Alphabet". USA Today. USA Today. Retrieved February 3, 2016. ↑ Davidson, Lauren. "Google unveils Alphabet... but that's already trademarked by BMW". Daily Telegraph. Retrieved August 12, 2015. ↑ Lardinois, Frederic (August 10, 2015). "Google Is Now Alphabet, But It Doesn't Own Alphabet.com". TechCrunch. AOL Inc. Retrieved August 11, 2015. ↑ David Stubbs (August 12, 2015). "Google's hooli.xyz Easter egg proves Silicon Valley is tech's own Spinal Tap". The Guardian. Retrieved February 28, 2016. ↑ "Google's new Alphabet, from A to Z (pictures) – CNET". CNET. Retrieved August 12, 2015. ↑ Bergen, Mark. "Eric Schmidt: Get Ready for 'a Lot' More Alphabet Companies". Re/code. Re/code. Retrieved October 19, 2015. ↑ "Google Inc. filing with the SEC, Form 8-K". United States Securities and Exchange Commission. August 10, 2015. Retrieved August 11, 2015.